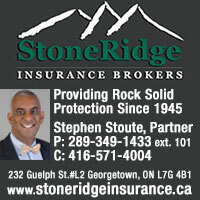 The Green Living Show in Toronto this past weekend was a great place to meet plenty of interesting people. Mike and I ran into some past and present (and maybe even future?) advertisers. Trees Ontario help you plant now for the future. 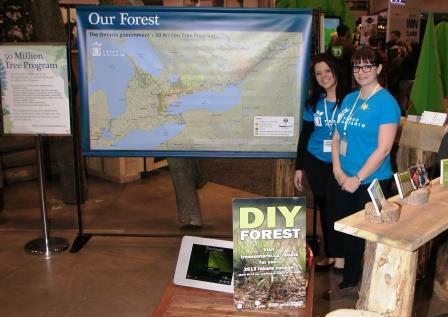 Monica Fuda and Krystle Coates were staffing a booth to promote Trees Ontario, which has subsidies available to people who want to reforest their properties. 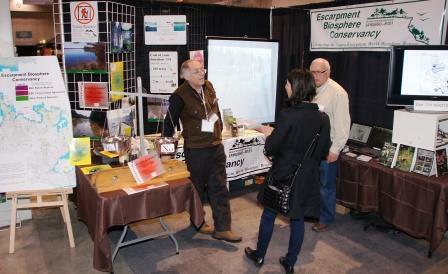 Bob Barnett had a popular exhibit for Escarpment Biosphere Conservancy that got people talking about land conservation efforts near the Niagara Escarpment. Lianne and James Krane know how to keep mosquitoes away, with Insect Defend Patch. The vitamin-B-powered trans-dermal patch sticks to bare skin and protects for 24 hours or so. 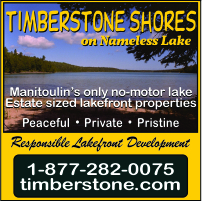 Doesn’t work against blackflies, unfortunately, which are due to bug us in a few weeks. 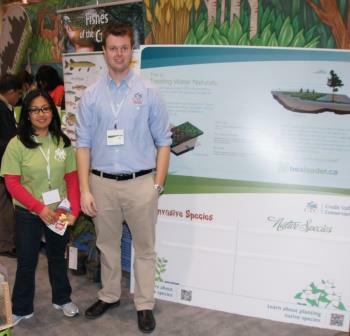 Credit Valley Conservation Authority’s informative booth was staffed by Jakub Wrobel and others. 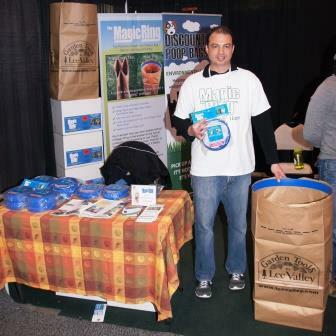 Paul Fulentic stood behind his Magic Ring leaf bag opener. The reusable plastic ring holds the bag open making it easier to clean up your town yard. I expect that rural residents are building great compost piles! Gordie Wornoff of A Higher Plane is a genius at reusing and upcycling junk. 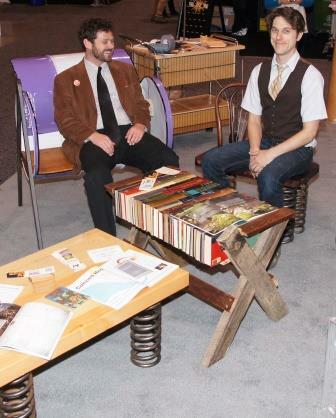 His bench from a metal barrel which is being enjoyed here by Eric Rumble, editor of Alternatives Journal, and the table top made of old books, were only two of his creations that are particularly striking. Lots of useful, interesting and fun ideas here! What do you think? Hi Guys, Thanks for the nice words about the Insect Defend Patch. 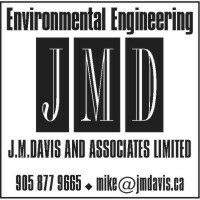 We have only tested on mosquitoes so that is all we can advertise but there have a number of testimonials from people who say they work great for blackflies. 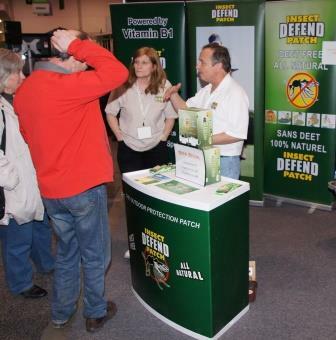 Check out Insect Defend Patch Testimonials on YouTube and hear for yourself..
Nice pictures from the show – I hope everybody enjoyed it as much as myself and my family did! Did anybody happen to catch us at the show? We were Fibertec Window and Door Mfg showcasing Fiberglass Windows for Energy Efficient Homes. By the way, I missed the Genius of Junk when I was there – I would have loved to see those spring chairs and table!! Thanks for your comment, Josh. Sorry, we missed you at the show. It was big! I couldn’t believe how big it was! It was my first time at that show. Also, I’d like to say I like your website. 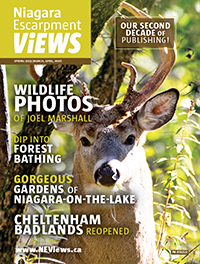 I found neviews.ca through the writeup you did on the Black Bank Hill project we were a part of.